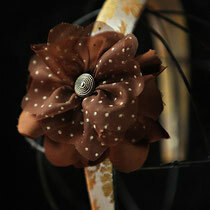 Handmade Vintage Headbands & Wraps - allputtogether's JimdoPage! BEAUTIFULLY HAND-CRAFTED ITEMS JUST FOR YOU! Our hand-crocheted headwraps are one of our best sellers, coming in beautiful vintage (Great Gatsby) styles in the spring and a wide range of appliqued styles such as OSU, Cavs, WV, Browns, KSU, U of A, peace signs, monkeys, moose, Bigfoot, owls, foxes, elephants, Captain America, Superman, Batman and more during the cooler months! We have a very nice selection in our shop on Front St.
Our one-of-a-kind headbands are definitely a customer favorite, popular amongst little girls, teens and adult women who love to adorn their hair with beautiful, unique embellishments. 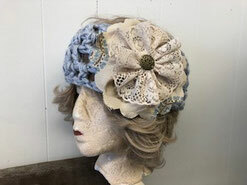 We make our handbands using vintage fabrics, lace and buttons from the 1920s through the 1970s. And the price is just right, at just $12.95 each or 2 for $24. For all of those special occasions like Prom, weddings, dances, holidays and special dates, we make gorgeous headbands using vintage silk neckties, tapestries, lush drapery fabrics and unbelievable laces and trims. Whether customers are looking for our funky owl headbands or our romantic lace-embellished styles, we've got something for everyone. We offer the wide selection of headbands at our favorite arts and crafts shows, often premiering spring dance styles and Christmas holiday varieties only available during those times of the year. You can also purchase our headbands in our shop on Front St.